Wow, I look truly spellbound by “Spellbound.” Well, I look kind of witchy anyway, which isn’t a bad thing. Here I am, back to the Ashmolean again, and sooner than I thought I would be. I did say when I posted about it previously that even though I was pretty annoyed with them for not having the dickhead plate there, or at least for not telling people that it was on loan, I was debating going back for the witchcraft exhibition in the fall. And that’s exactly what happened, the lure of witches being far too great to resist. Besides, Halloween events in London were pretty lacking this year – mostly just lectures, which I would normally have attended, but with my brother here the week most of them were on, I skipped them in favour of doing stuff with him (as you’ll see in future posts), since he’s not a big lecture person. And of course I had to have a Halloween post, so “Spellbound: Magic, Ritual, and Witchcraft” fits the bill nicely. 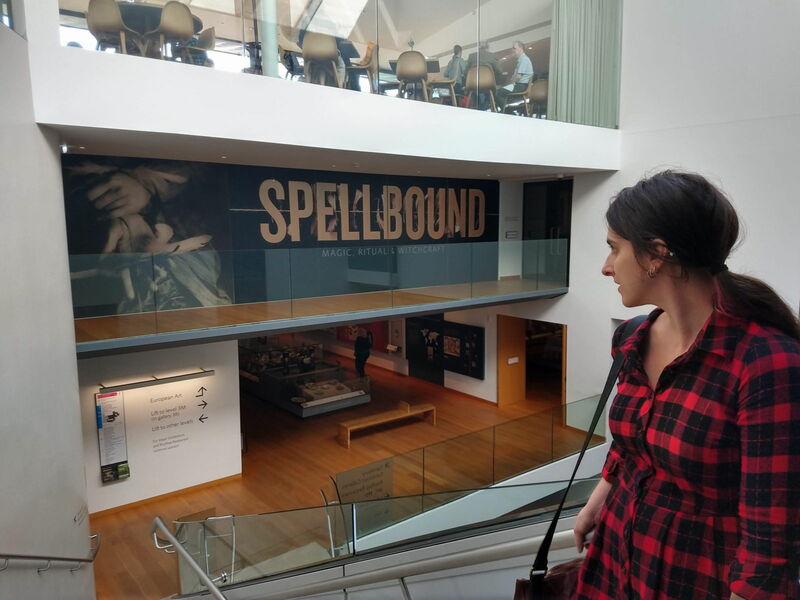 But I didn’t travel all the way up to Oxford and only see “Spellbound.” Even though we were only visiting Oxford for about four hours on this trip, we still had time to return to the Weston Library. After the success of “Sappho to Suffrage” and “Designing English”, I was keen to see what else they were offering. Well, “Sappho to Suffrage” was still there, but they did have a new display in the foyer called “Unhealthy Times of Kings and Queens” which was right up my alley (I’ve only just realised that British people say “up my street” instead (after co-workers kept sending me links to various weird exhibitions with the subject line, “This looks up your street.” They weren’t wrong), which I can’t quite bring myself to do). 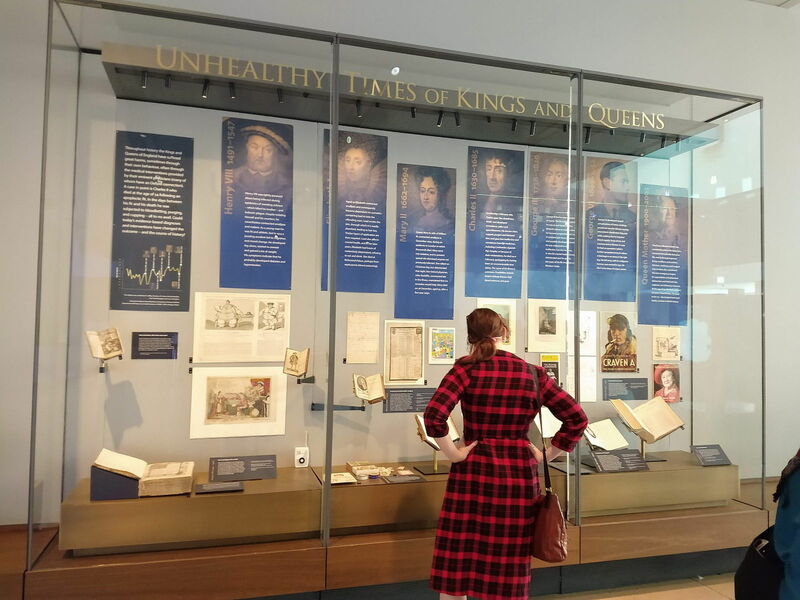 This was only one small case, and I would have loved a whole exhibition’s worth, but what was here was pretty great, including little blurbs about various British monarchs and their ailments and plenty of artefacts to illustrate how those illnesses were viewed at the times these monarchs suffered from them. 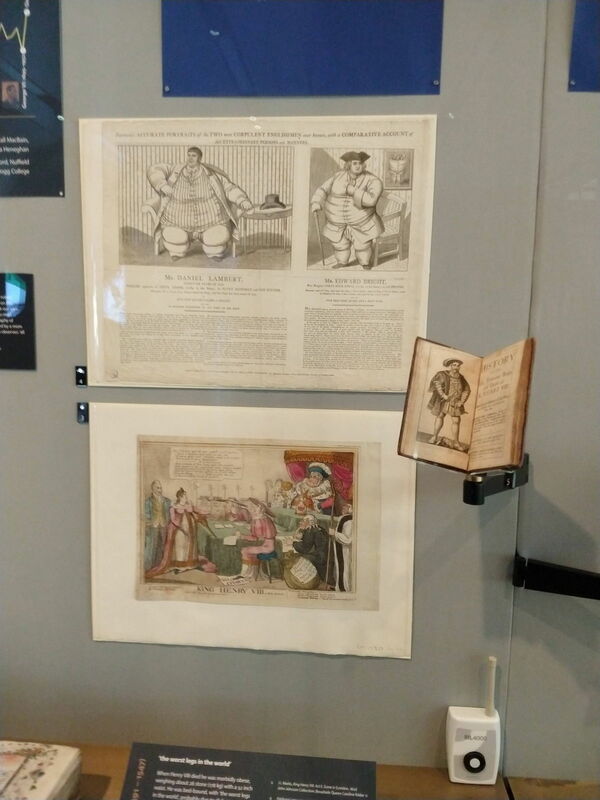 Daniel Lambert (Georgian Britain’s fattest man. I have a Staffordshire knockoff figurine of him) even made an appearance, and I absolutely love the description of him in the pamphlet on display: “a truly astounding prodigy of human dimensions.” It seems a rather nice way of calling someone fat. 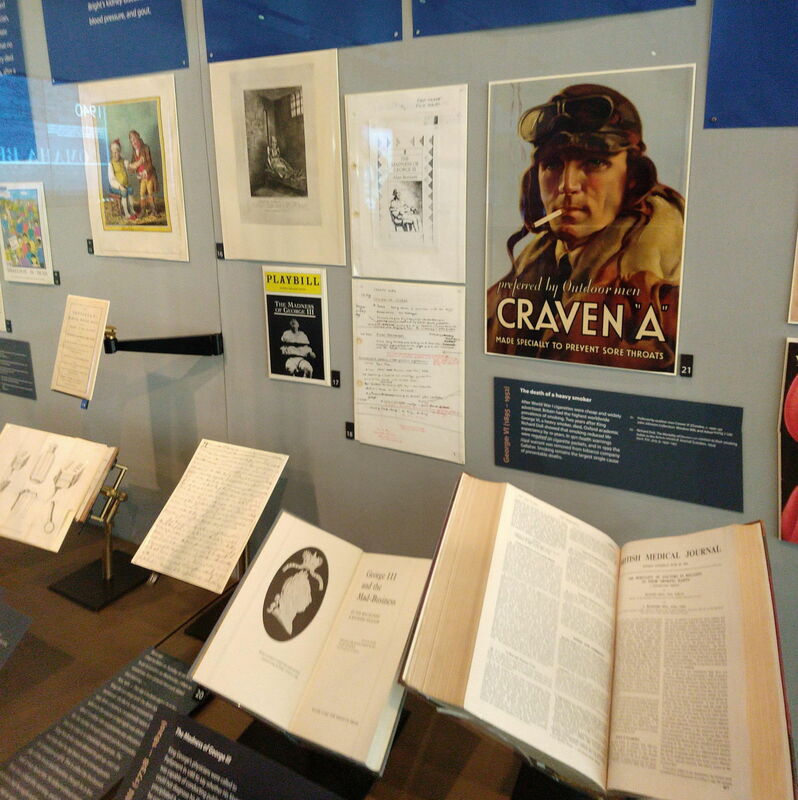 Rather less excitingly, the main exhibition at the Weston (which has since ended) was on Tolkien. I think I’ve probably said this before, but I hate The Lord of the Rings books, I hate the movies, I hate all of it. A librarian recommended The Hobbit to me when I was a kid, and extremely keen reader though I was (and am), I only made it about a third of the way through before giving up from sheer boredom. I know that many people love Tolkien, and I’m glad that they’re passionate about books and all, but those particular books are just not for me. Nonetheless, we were there, it was free, and so we went. Pictures were not allowed inside, but it was about what you would expect, both in terms of content, and the people visiting it. I sometimes make a half-assed effort not to say terrible things about people, but this exhibition was full of some real nerds (not that there’s anything wrong with being a nerd, but I just don’t quite get that type of nerd). It was really crowded, and everyone here looked like LotR fans, if you know what I mean. Balding men with long hair (which sounds like an oxymoron, but isn’t. It’s when they’re bald on top but grow the back part really long, kind of like Bill Bailey) and gamer t-shirts, women with hair down to their knees, elf ears, that whole sort of scene. Honestly, I barely looked at the first editions and Tolkien’s drawings of elf-land, or whatever the hell it’s called, because there were so many people crowded in front of them, and since I’ve never read the books, they didn’t mean anything to me. 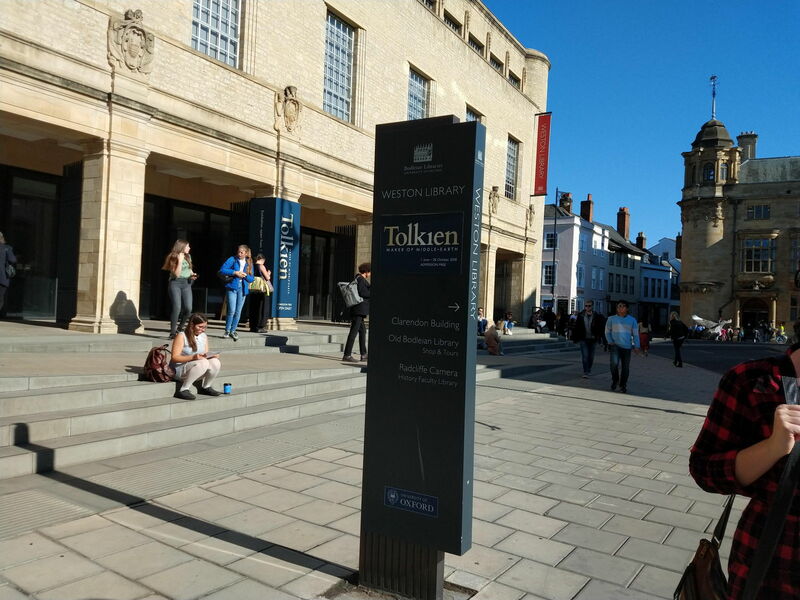 I was more interested in the story of Tolkien’s life, though the exhibit seemed to skip oddly from his student years, to him being a full on professor at Oxford (though I’ve been reading ghost stories all through October, which means a lot of M.R. James and E.F. Benson, and honestly that’s just how it seemed things worked back in the day. Graduate from Oxbridge, and we’ll hand you a professorship that you’ll hold until you die. Must be nice, at least if you ignore all the curses and hauntings in those stories). I did think the letters he used to write to his children, as Santa, were quite sweet, and those were probably the highlight of the exhibition for me. 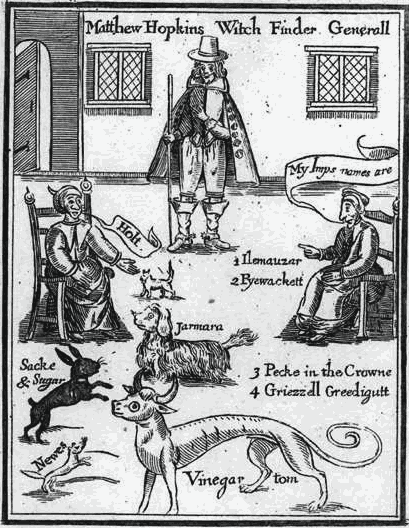 Matthew Hopkins, self-proclaimed Witch Finder General. This guy was seriously the worst. Having made it through the Tolkien exhibition in 15 minutes, we had time to head over to a street market for a quick snack (I got polenta fries with pesto, but in retrospect I think I should have gone with the Sri Lankan dhal and potato fry with roti or the vegetable momos) before going to the Ashmolean to see “Spellbound.” It normally costs £12, but we got half price tickets due to the National Art Pass, and I did pre-book, since we were making a special trip to see it. It runs until 6th January 2019. It was on the third floor, and also did not allow photography, more’s the pity, since of course there were some rad things in here (I’ve found a few images online, but not many). 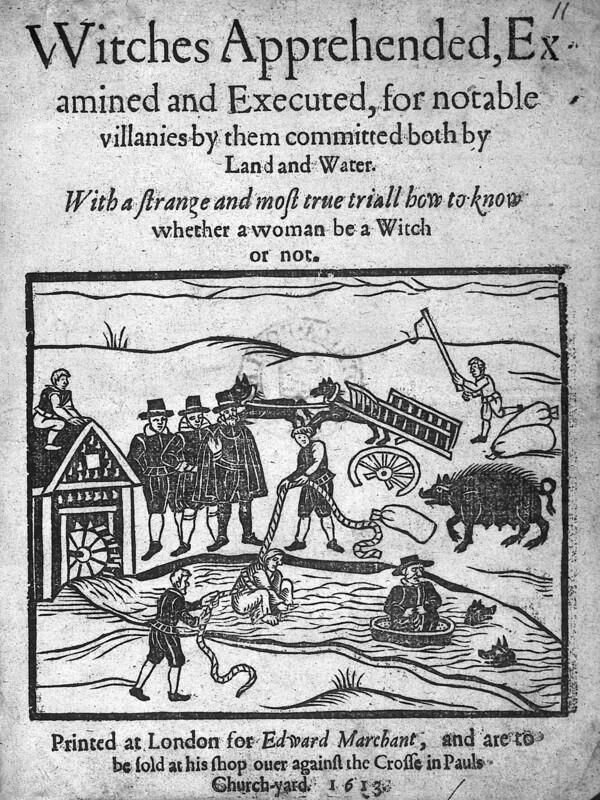 Witches apprehended, examined and executed for notable villanies by them committed both by land and water. Credit: Wellcome Library, London. While I liked the very beginning of the exhibition, which tested your belief in superstition by asking you to walk under a ladder, I was a little disappointed with the next gallery, because the focus was more on medieval magical practices, like sorcery, alchemy, the use of saints’ relics, and the like, which are interesting, but not really what I think of when I think of witchcraft, especially as these were usually practiced by men, and were mainly tolerated by the authorities. Nonetheless, there were some fabulous old texts in here, and one of the coolest objects in the entire exhibition: a human heart encased in lead. I also liked the witch quilt (which if I remember correctly, was sewn by female prisoners), and was kind of shocked by the size of the narwhal horns – I hadn’t realised quite how big they were, which made it even more perplexing that people would have thought they were unicorn horns. How big did people think unicorns would have been?! 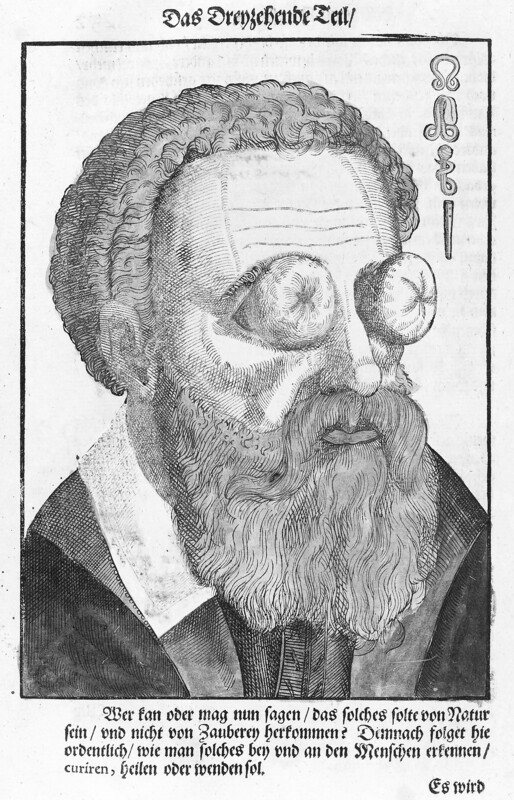 Disease of the eye caused by witchcraft. I know this shouldn’t make me laugh, but it does, every time. 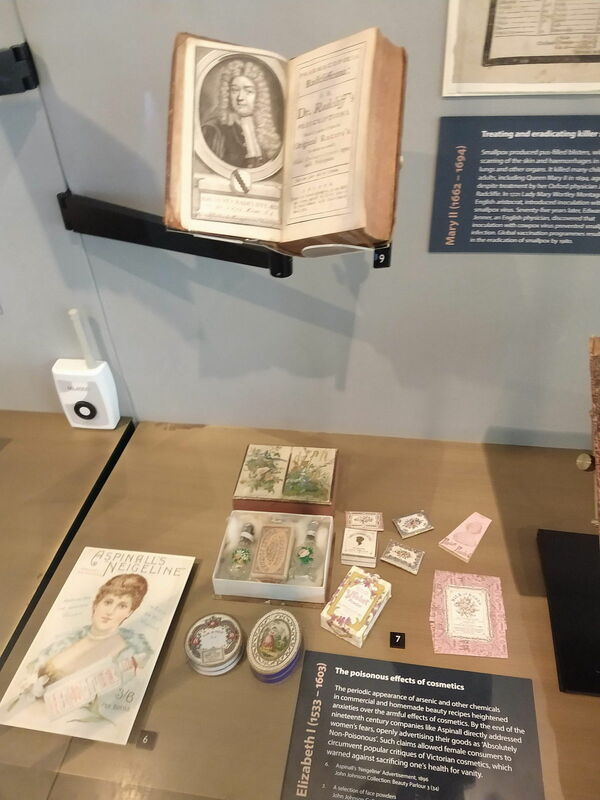 The next gallery was about the objects that people had concealed in their houses throughout the early modern era to try to protect themselves from witches. Obviously I loved the mummified cat and rat, but all the witches’ bottles and random shoes and things were great too, and it was much more atmospheric in here, being a dimly lit gallery with little cubbyholes that you had to enter to view the artefacts. This was more like what I was expecting, especially Katharine Dowson’s installation at the end of the gallery, called “Concealed Shield.” It was a darkened room with a red-lit glass heart in the centre and red lights playing on the walls, with scrabbling sound effects that were meant to sound like demons. I loved it so much I went inside three times. 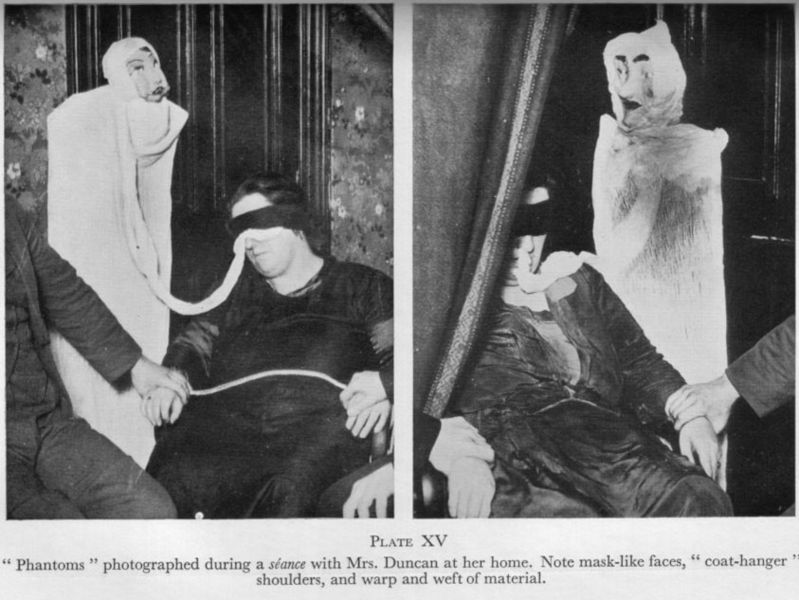 Helen Duncan producing ectoplasm and manifesting one of her spirit guides, who looks like he (she?) belongs in the Puppet Museum in Lyon. The final, and fullest gallery, was more straightforwardly about witches, as in the women (and some men) who were wrongfully executed during the early modern witch craze, and how that formed our idea of what a witch is. There were fantastic prints here, some reminiscent of the ones I saw at the BM a few years ago; a lovely book showing a witch and her toad familiars (I would definitely have toad familiars), and some general witchy objects borrowed from the Witchcraft Museum in Boscastle, though none quite as cool as the stuff that had been at the Harry Potter exhibition at the BL. There was also a room where you could listen to the “confession” of a woman who was accused of witchcraft (and executed as a result), and another just filled with flames (though I feel I should reiterate this until society at large gets it: English and American witches were hanged, not burned, unless their alleged crime also included petty treason (for women, this meant the murder of their husband). Plenty of people were burned for witchcraft in Scotland and the Continent though, and the point stands that all of those people were wrongfully executed, regardless of how it was done). There was also a small section about mediums, in particular Helen Duncan, who, in the 1940s, was the last person convicted under the Witchcraft Act of 1735 (still on the books until 1951, though the 1735 Act repealed earlier ones that called for executing witches. The 1735 Act merely carried penalties of a fine or prison term). Although Duncan was undoubtedly a fraud (firstly, because ghosts aren’t real (probably), and secondly, once you’ve seen the “ectoplasm,” which was just a piece of fabric, and the pictures of her manifesting it and her “spirit guides,” you have to wonder how anyone took her seriously in the first place), people were angered by the use of this clearly obsolete act in prosecuting Duncan, and it was replaced by the Fraudulent Mediums Act, which prosecuted them for bilking the gullible out of money, rather than for the practice of witchcraft. I actually loved this section, because ghosts are possibly even more Halloweeny than witches, and having them both here was a nice surprise. The shop had looked great before I went in it, since I spotted some cool looking pentagram candle holders from the door, but it turns out initial appearances were deceiving, as it was mostly full of non-witch related scarves and shawls (not even witch-looking ones, because I am totally down to buy a witch cloak if I can find a suitable (non-Harry Potter related) one). Still, I bought a skeleton pin badge and a couple postcards. I was a little disappointed in the exhibition, because it was too heavy on medieval magic for my taste, and some of the artefacts weren’t exactly what I was hoping for, but I still enjoyed it. It wasn’t as good as the Witchcraft Museum in Boscastle, or even the Harry Potter exhibition (though it was pleasanter to look around than the latter, being much less crowded), but it was still the kind of exhibition I love seeing in October. 3.5/5. 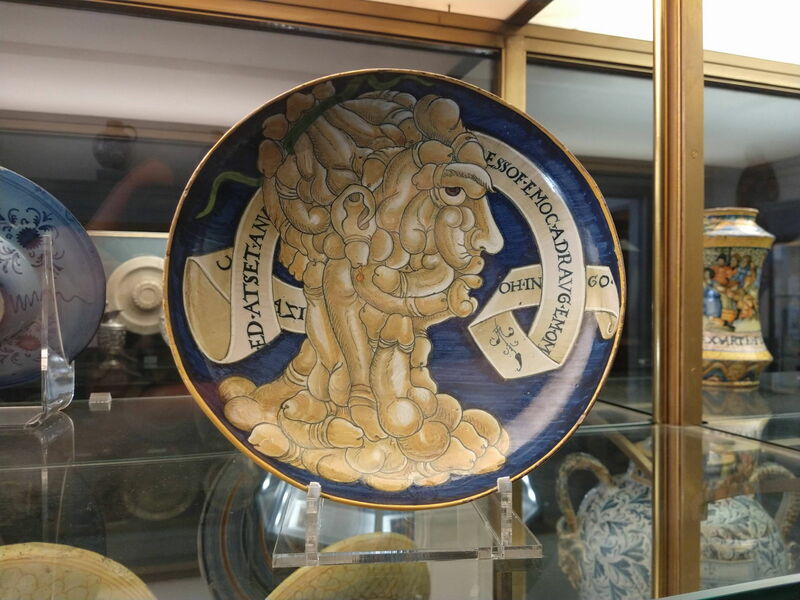 Oh, and we went back through the Ashmolean to check for the dickhead plate, and guess what? It is finally back, and it is so worth seeing in person (actually, you probably already guessed that, due to the positioning of that photo). Happy Halloween everyone! 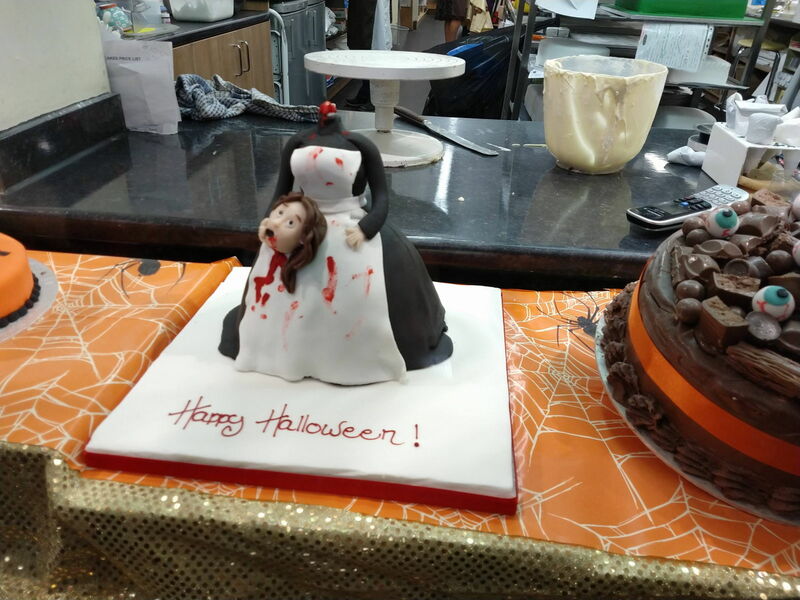 I spotted this cake in an Oxford bakery, and I kind of wish I’d commissioned one with my face on the decapitated head, though I suppose the one already on it looks a bit like me. Yes I was in the exhibition about 4 minutes and yes was full of stereotyped visitors. On Youtube there was even some young lady who had taught herself Elfin (???) or some such made up language. I guess it will come in handy some day…. It is nice that they are so passionate about something harmless, I guess, I just really don’t understand that particular kind of geekdom, which I probably made all too clear in the post! I did make it all the way through The Hobbit but never felt inspired to go on to LotR. I did an option at uni called Religion and the Decline of Magic so I would probably have enjoyed the medieval magic bits. I still have the set text on my bookshelves and keep meaning to reread it. Somehow I have never quite got round to it, and I doubt i’d have the attention span now. I did an online course a few years back on medieval magic, which I did find enjoyable, it just wasn’t what I wanted from a witchcraft exhibition, since to me it’s not quite the same thing. So, will your review be added to the project’s review list: https://innerlives.org/outputs/ or not. I doubt it, since I’m not writing for an actual publication! That plate would make any length journey worthwhile!! Funny, the whole Lord of the Rings thing leaves me cold too. I never managed the books and don’t recall a thing about the two movies I was dragged to. It’s very strange because everyone else seems so fanatical about them. Glad to know I’ve got some company. Oh my god, Bill Bailey hair and elf ears – yep, that really is a special kind of nerd. I’d have been tempted to turn back at the gate. Those bewitched, engorged eyeballs are hilarious – though I wouldn’t want anything remotely like that to happen to mine. The witch quilt sounds neat – I’d love to see it. But man, that Helen Duncan bit – so ridiculous! You can’t help but wonder what was wrong with people that they’d be so gullible. I love that adorable headless cake. And I can tell I’d like the one with eyeballs next to it too. Damn, now I wish I’d thought to celebrate with something like that. Glad I’m not the only one who finds eyeball man hilarious, though I am scared that by laughing at him, I’ll bring it on myself. It’s crazy that Helen Duncan was active until the 1950s! The sad thing is that people were probably willing to believe in her because they were so desperate to contact their loved ones again, since she exploited all the deaths from the First and Second World Wars. I just made jack o’lantern cupcakes, as you probably saw! Not as fun as eyeballs or a headless woman. Your cupcakes were so cute! I’d gladly have a tray of them now.